Fantastic holiday home with 3 bedrooms, 2 bathrooms, large kitchen and spacious living room. The elegant. Fantastic holiday home with 3 bedrooms, 2 bathrooms, large kitchen and spacious living room. The elegant, tasteful décor offers plenty of space to sit and relax with a good book or get together with your loved ones, such as the beautifully designed dining area in the kitchen. There is a large pool with sun loungers. The house is located in a quiet area in the village of Tordera, which is known for its Sunday market. This beautiful villa is made from brick or stone and was originally built in 1980 and refurbished in 2013. The agent has rated it as a four star property so it is a well-equipped villa with above average furnishings. It is also great value for money. 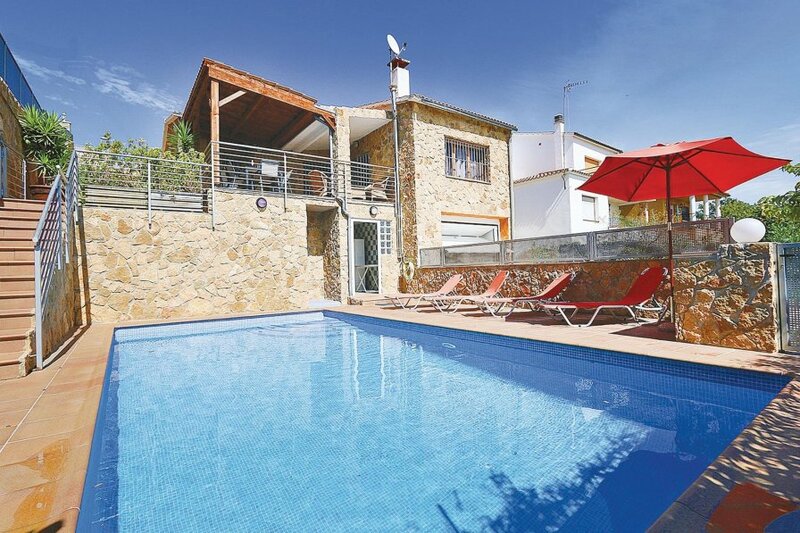 This villa has a swimming pool and mountain view; it is also located in Tordera, only 5.8km from Blanes. The nearest airport is only 28km away. It is set in a good location, 4.5km away from a sandy beach. There's also a restaurant 2.3km away. The villa has free wireless internet. The villa is well equipped: it has a refrigerator, microwave with oven, washing machine and dishwasher. It also has a barbecue, a garden and some garden furniture outside. There is a marked trail more than 10km long nearby.